Can anyone confirm a 1940s school kid signature of LC? I posted this on the Leonard Cohen sub-reddit the other day, and was directed here. And from what I've seen, it's definitely the place to ask! 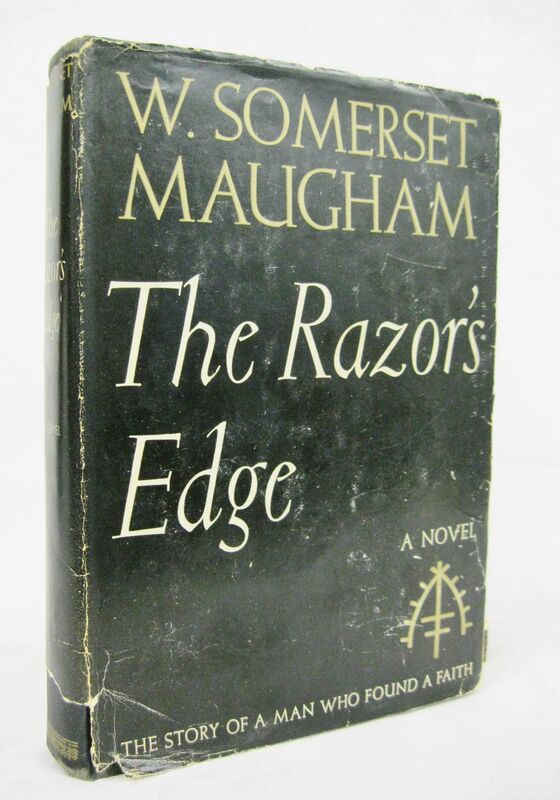 I discovered this signature in W. Somerset Maugham's "The Razor's Edge", published 1944. 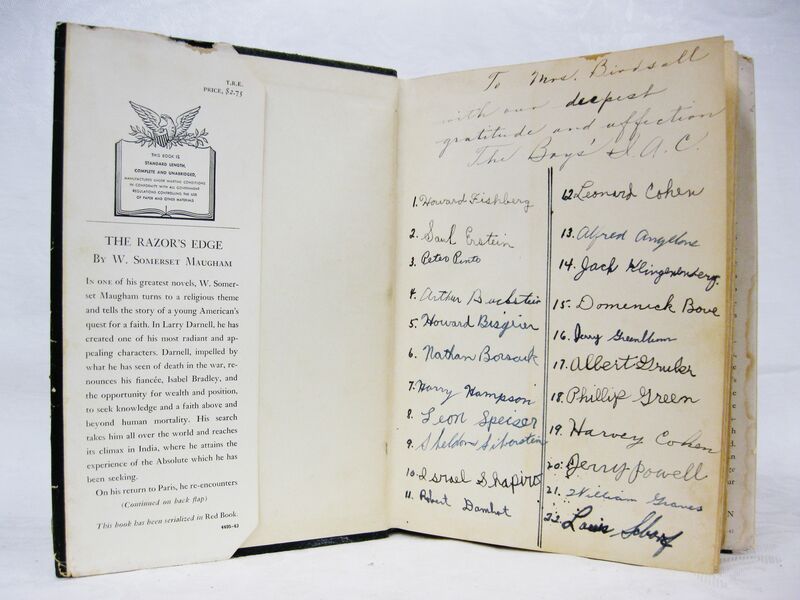 There's nothing special about the book, except that on the front endpage there's a dedication to a Mrs Birdsall from 22 of her students, one of which is signed Leonard Cohen. I presume he would would have been between 10-13 or maybe 14...? What could The Boy's I.A.C. be? My usual way to confirm signatures is to compare to images on the internet, but handwriting can change quite a bit from your school days... not that he ever had a crazy signature. Any ideas greatly appreciated. I'm in Colorado, but I can trace the book's ownership history back to a guy who lived in Connecticut in the '50s and '60s. I've searched some of the student names, not too much luck there. Just Jack Klingenberg, who was born in Europe in 1934 (same year as Cohen), but died in Canada. That's the closest link I can find. Re: Can anyone confirm a 1940s school kid signature of LC? Soory I cannot help, but it is a great find anyway. I'm no expert by any means, but I've witnessed Leonard signing stuff many times, and I can see traits of his writing in here. His signature did vary, so I'd like to think it is real. I could be proved wrong, but until that is the case I'd take this at face value! "Our" Leonard may be unique but is Leonard Cohen really such an unusual name? It's a lovely find but it seems quite a leap to assume that it originated in Montreal, Canada. Where was the book published? I always approach a signature with caution - I once came across an Albert Camus signature with an inscription in English. With a minute of research I determined it was super fake, and with one thing or another I figured it was probably a joke between friends! And the other day I came across a Michael Jackson memoir where the publisher *printed* a sketch and a signature... super annoying for a collector. Valid thoughts, absolutely! The book is a US printing, but there may not have been a Canadian printing. And Montreal isn't so far from the border. I think I can confidently trace the book back to Connecticut in the '50s or '60s. And books do get around! One thing that I think would greatly help is determining what "The Boy's I.A.C." is, or was. I read on Wikipedia that LC was active in a bunch of extra-curriculars in school: "Cohen involved himself actively beyond Westmount's curriculum, in photography, on the yearbook staff, as a cheerleader, in campus clubs (Art, Current Events), and even when "heavily involved in the school's theater program", he served in the position of president of the Students' Council." I do plan on listing this on eBay - I'll wait a while longer in case I get further information, but one way or another I'll include all the caveats and let the buyer decide for themselves. We sell under "thebookguys", in case you're curious. Maybe she'll know about the Boys IAC or perhaps she has seen Leonard's early autograph. Boys IAC can perhaps mean members of a team of Interstate Athletics Conference. What I understand of Wikipedia is that this a high school sport league made up of 6 private schools in the Washington DC area. That would not fit “our”Leonard but as mentioned by others there are also other Leonard Cohen in this world . That is very possible, certainly! Mabeanie1 wrote: ↑ "Our" Leonard may be unique but is Leonard Cohen really such an unusual name? "Leonard Cohen: On those who litter, and those who help"
I do plan on listing this on eBay - I'll wait a while longer in case I get further information, but one way or another I'll include all the caveats and let the buyer decide for themselves. We sell under "thebookguys"
So... nothing promising. Maybe it's the guy from Northampton Might just have to stow it away somewhere as a curiosity, anyway. i once borrowed an interesting book about bob dylan from my local library. i had studied his untidy handwriting, and before returning it scrawled on one of the first pages "best wishes from bob dylan". i tried several times to borrow it once more, but was told someone had taken it out - and it was never returned. a little later on the library installed an alarm system that made a loud peeping noise every time somebody took out a book that hadn't been cleared at the desk. i like to think that i was a little bit responsible for our library's new security measures.